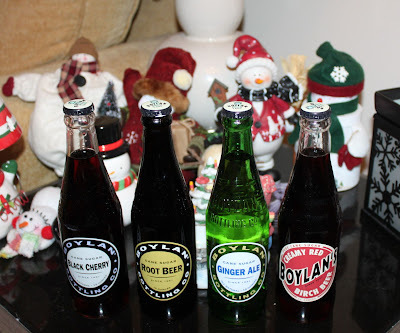 Beautiful Incentives: Boylan Bottling Soda Review & Giveaway! Boylan Bottling Soda Review & Giveaway! I'm not a big soda drinker, but during the holidays I like to allow myself some splurging room. It's my gift to myself. There was no better way to do this than with the Boylan Winter Wonderbox. I enjoyed every single one of them. Boylan Bottling is a soda company that uses quality ingredients and real cane sugar to sweeten their product. They also carry seltzer water, diet sodas and mixers. They have been around since 1891 and I can tell why. Their soda is delicious and unlike your average canned Coca Cola. Boylan sent me their specialty Winter Wonderbox with12 bottles. It contained 4 very yummy flavors: Black Cherry, Root Beer, Ginger Ale and Creamy red birch beer. The last one I had never tried and loved it. I think my favorite flavor of all of them was that one. It had a more unique taste compared to the rest. Right now, Boylan is donating 10% of all Winter Wonderbox online sales to the Sandy Relief Fund. What better time to enjoy the holidays with a refreshing yummy beverage and give to those that have much less at the same time? You can find Boylan at most super markets. I know here in Florida they carry them at Publix and Winn Dixie near me. So chances are high if you go to their site to search for a retailer, you will find one near you too. At just $15 a box, you cannot lose. If you'd like to purchase one online, you only have until December 31, so hurry! Enjoy your holidays and this giveaway for your chance at a free 12 bottle Winter Wonderbox! Win 12 bottles of yummy boyland bottling soda. 4 different flavors to tantalize your taste buds thrice! Good luck!